The Angry Panda project provides fast, cheap and secure ways to send payments through Waves-based tokens and its blockchain. The refund prices available for most of our cryptocurrencies allow investors to HODL and trade safely on exchanges even during the bear markets, being more protected against significant losses in value. Angry Panda supports the price of all its tokens through a refund system in USD/EUR. In this way it guarantees the value of your tokens and investments during down trends and bear markets. ROAR, refund at 95% of the price, only if bought during PRE-ICO or ICO phase. Afterwards we offer a swap: every 25 XPAND tokens sold by us, 1 XPAND token will be available to be swapped 1:1 vs ROAR tokens. Your investment would be always safe during down trends and bear markets, since we guarantee a rebuy of our tokens when the prices go under 1,000$ (XPAND), 1$ (UBEAR) and 1€ (EBEAR). Indeed, the value of the Angry Panda tokens will probably increase, if all the other coins go down. For XPAND tokens we will try to keep the price between 1,000$ and 1,100$, through our rebuy system and by setting a very high amount of XPAND tokens at 1,100$, allowing about a 10% price fluctuation. ROAR tokens are sold from 1$ to 512$ during the initial coin offering and the potential profit could be, therefore, very high. Furthermore, every 25 XPAND sold by us, 1 XPAND token will be available to be swapped 1:1 vs ROAR tokens. Since XPAND issue price is 1,050$ with a rebuy at 1,000$, the potential profit of ROAR tokens can be +99000% and even more. The potential profit of XPAND tokens is about 10% if traded vs USD. Instead there are no limits if traded vs any other token. There are no limits of profit for UBEAR and EBEAR tokens. 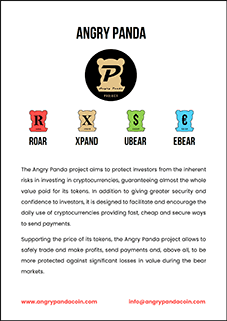 You can trade the Angry Panda tokens – ROAR, XPAND, UBEAR, EBEAR – on Waves DEX vs any other token (all pairs are available) without any limits of amount or price, except for the limits of price in USD and EUR described before. It is really easy to understand the minimum value of your investment, regardless of whether you are a small or a big investor, because the minimum price of XPAND token is 1,000$, for UBEAR is 1$ and for EBEAR is 1€. Transactions and confirmations in few seconds: 1”-3”. Sending any amount of money globally costs less than 0.001 Waves ~ 0.0025$ actually. The roadmap below shows what we have already achieved, what is going to be made and approximate terms: presale, ICO, main sale, token swap, atomic swap, dual-blockchain, exchange listings and more. Integration of the Angry Panda Shop on our website to sell digital items, physical products and services. Promotion of Waves-based tokens on our website and sale through the Angry Panda Shop. Use our tokens as digital money to make fast, cheap and secure payments. Token swap 1:1 from ROAR vs XPAND on Waves Platform. Creation of Angry Panda Node to lease your Waves. Angry Panda desktop and mobile wallets. Getting listed on the most important exchanges. Creation of Angry Panda Exchange.